Before the player, the choice of the hero, for which the sports career will occur. 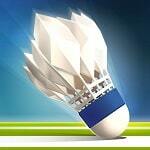 Your task is to defeat strong opponents in badminton and get the title of champion. Choose one of several types of game modes, as well as maps and type of competition.